OK, so I have a ton of glass from the Janvier Road bungalow. We poured lemonade from it, drank from it, served fruit and potato salad in it. My mom told me there was a difference between pressed and cut glass, but it all looked the same to me. “How can you tell?” I asked my mom. Oh, OK. And that’s where things stood until years later, when I began to realize what I had. And I’m so thankful we rescued it when we sold the bungalow land. Why, I wasn’t even using the correct terms! “Cut glass” is “American Brilliant cut glass” or “American Brilliant Period” (ABP) glass, and the “pressed” stuff is “Early American Pattern Glass” (EAPG). Which is which? I’m learning that it isn’t always easy to tell. It might take me years to get it all straight! But in the meantime, I’ll share what I learn as I learn it. In fact, I just ordered what reviewers claim is the best book on identifying EAPG patterns. Perhaps that will help me separate the EAPG from the Brilliant. I hope. After the glass was blown or poured into a plain mold, skilled craftspeople cut sharp, deep designs into the glass using rotating wheels. Any mold lines were carefully polished away. The end result is gorgeous. What happens to light as it passes through a fine piece of brilliant glass is breathtaking and something you must see to appreciate. And when Americans saw it at the 1876 Centennial Exposition in Philadelphia, they couldn’t get enough of it. Everyone who was anyone – including the President – used Brilliant glass, much of it designed for special foods, such as bananas, fruits and celery. My grandparents even got some pieces when they built the summer bungalow. Then World War I came along, and the popularity of American Brilliant waned because the materials and artisans were needed for the war effort. American Brilliant Nappy, Possibly Fry, Circa 1900s. 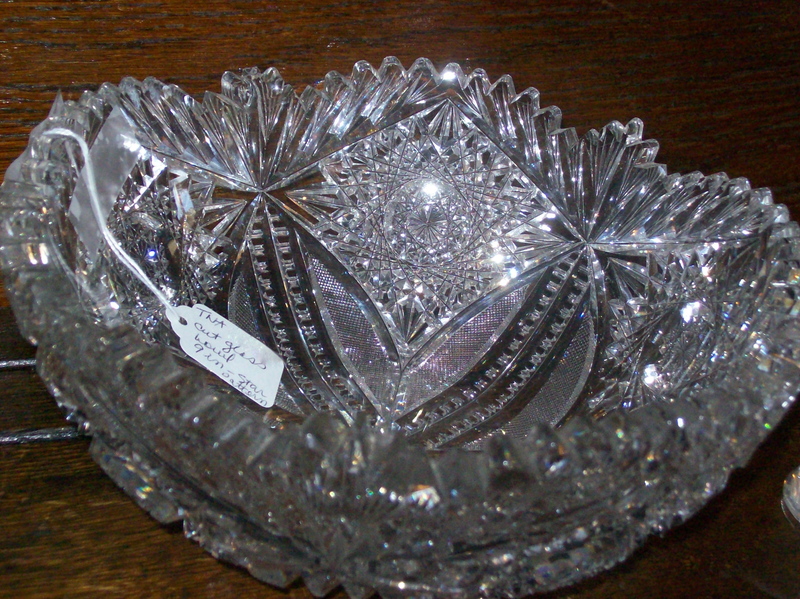 Early American Pattern Glass (EAPG). Basically, much of EAPG is American Brilliant Cut glass for the masses, and most was made during approximately the same period (1850 – 1910). 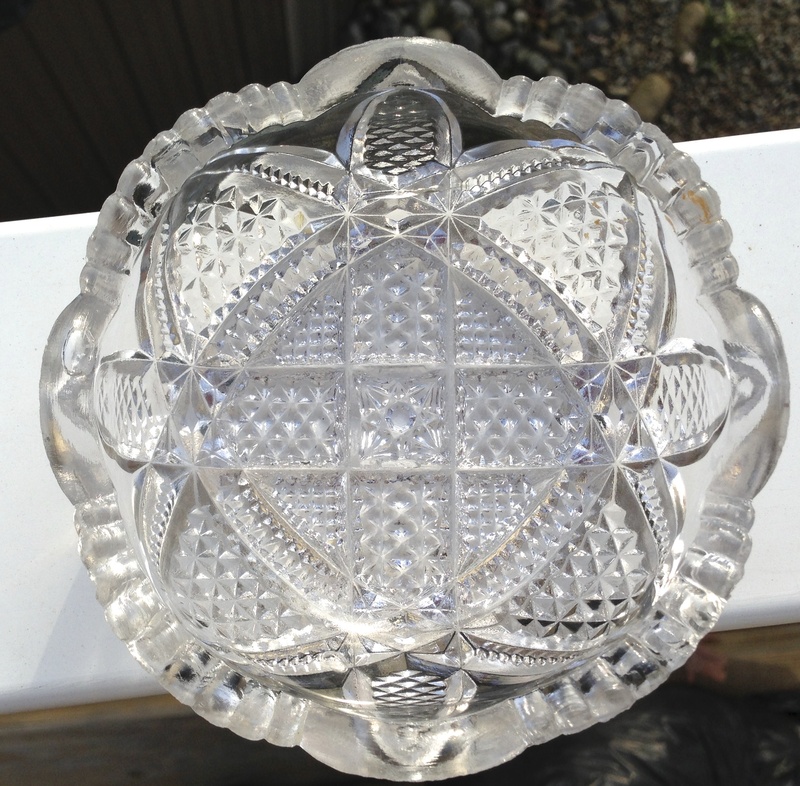 Molten glass was pressed into molds patterned with many of the same motifs as their more expensive cousins. This method produced lovely glass that was far more affordable. 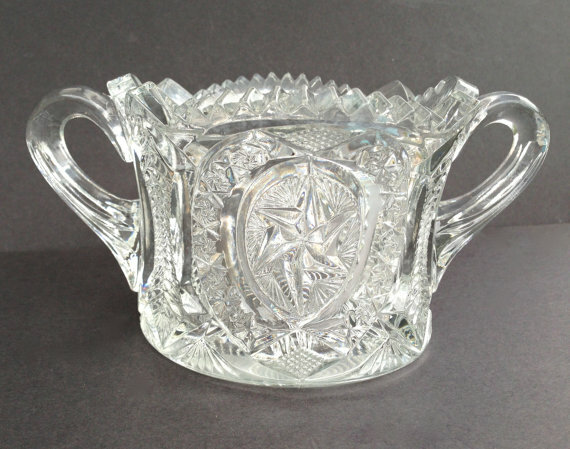 But, because the patterns are so similar to those of American Brilliant, and because companies became good at polishing the mold lines and adding some hand-etched touches, telling EAPG from American brilliant (and the later Elegant Glass) can often be tricky. Even some experts may struggle deciding whether a piece is EAPG or Brilliant. But these are the major differences that will help you get started. American Brilliant doesn’t have mold marks. EAPG has very thin raised lines where molten glass filled the gap where the mold parts come together. Be careful, because some mold lines are cleverly hidden by part of the pattern. You may feel them on the inside of the piece. Cut glass patterns are sharply defined. EAPG’s details are often slightly blurred. It flouresces under black light and has some sharp edges, but it’s EAPG. Contrast this little bowl with the nappy above. It pays to visit a museum in order to familiarize yourself with Brilliant vs. EAPG. Cut glass patterns may have slight irregularities, since they were fashioned by hand. Pressed glass may have slight dimples on the inside that mirror the pattern on the outside. McKee’s “Prescut” and Imperial’s Nucut are EAPG, not American Brilliant, even though they look and feel like cut glass. And McKee’s “Innovation” line also added hand-cut detailing to the pressed mold glass. Unusually large Nortec “PRESCUT” covered sugar without lid. And yes, cut glass feels “sharper” when you run your fingers over it. Pressed glass may look hand-cut, but the points will be much smoother. The other day, I unpacked another box of items to list on Etsy. I unwrapped the nappy shown above. Within seconds I knew it was American Brilliant. Once you’ve held the real thing in your hands, you’ll never be in doubt about the difference again! You don’t need to be a serious collector to fall in love with American Brilliant and EAPG. Several pieces will lend instant authenticity and richness to traditional décor. A single bowl or pitcher can give a sleek, contemporary room a dramatic focal point. And cut or pressed glass is the perfect choice for those whose taste runs to eclectic and “found” items. If you love learning about antiques as much as I do, follow the blog so you won’t miss the next article. 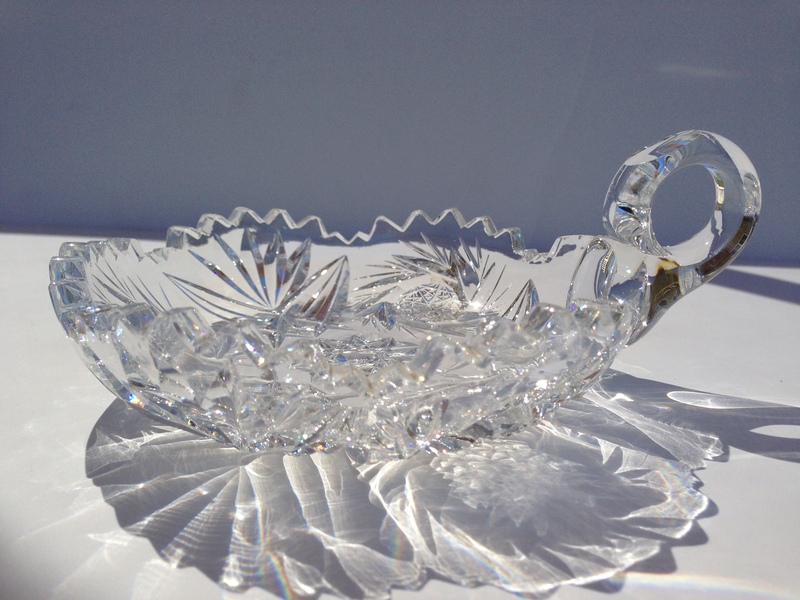 This entry was posted in Antiques, Etsy, Glass and tagged American Brilliant, antique American glass, banana bowl, cut glass, Cut glass nappy, difference between pressed and cut glass, EAPG, EAPG sugar bowl, etched glass, Etsy, Fry Glass Co, Janvier Road, McKee Innovation, movie props, nappy, Nortec, Nucut, open sugar, Prescut, pressed glass, theatre props, video props, vintage etched glass, vintage glass, White House dinnerware. Bookmark the permalink. 17 Responses to Is it Pressed Glass or Cut Glass? THank you for this article. It is / was very helpful in my understanding of what I recently purchased at an estate sale. It is an EAPG McKee Aztec pattern punch bowl set (large!) with 24 cups and glass ladle, purchased for $60.00. It is so beautiful. Thank you for helping me know what I bought! It belonged to the homeowners great grandmother; we used it the same evening that I bought it. Wow – it’s amazing that you were able to get the entire set! And it’s also great that you’re enjoying it! Thank you for this article. It helped me alot to understand the difference. At my very first auction, a wise old one told me, “Never pay more than the thing is worth to YOU…” I have yet to find her advice “lacking…” If you love something, the pedigree does not matter. It is better to live your own life, and fill your days with your own delights! I have a glass ferner with a hobstars and daisy pattern similar to Mckee Innovation, but I am pretty sure it is not, because it lacks the characteristic octagonal buttons. Is there a way I could se you pictures and get your thoughts on who may have made it? That’s one reason I’ve saved my glass for last (to sell on Etsy). I have BOXES of the stuff, and I think most of it is EAPG, but I’d hate to call it something that it isn’t. I think it’s time for another visit to Wheaton Village. HAHAHA! Thank you for explaining the differences….I also struggle with this!